For the review, click below! My father is British, so I've been to the UK quite a number of times in my life. For the most part, the Cadbury Chocolates you can buy in Canada are the same as the UK (though, the chocolate does taste better across the pond). Growing up, they never had Cadbury Flake in Canada, so whenever I am there, that is my go to bar. Wikipedia, as usual, has a pretty detailed history of the Wispa. 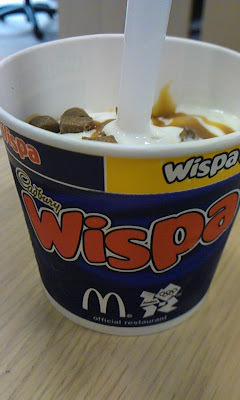 McDonald's in the UK had a Wispa McFlurry in 2008 (when the product was being relaunched), and to show their support for the London Olympics, they brought it back, along with a 'Gold' edition (topped with Caramel instead of fudge), and naturally, that was the one I tried. 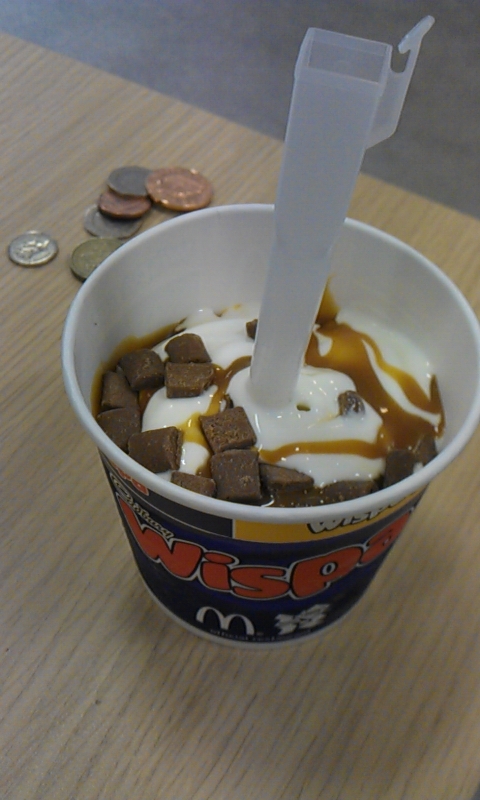 I had a McFlurry as a part of my lunch, and visited the Liverpool Street Station branch as it was the closest to my office. I thought I was going to beat the lunchtime rush by visiting at 12:30 but I was wrong, as when I entered there was a queue out the door. I debated coming back another day, but I noticed it was moving surprisingly quickly, so I stuck it out, it actually only took a couple of minutes. 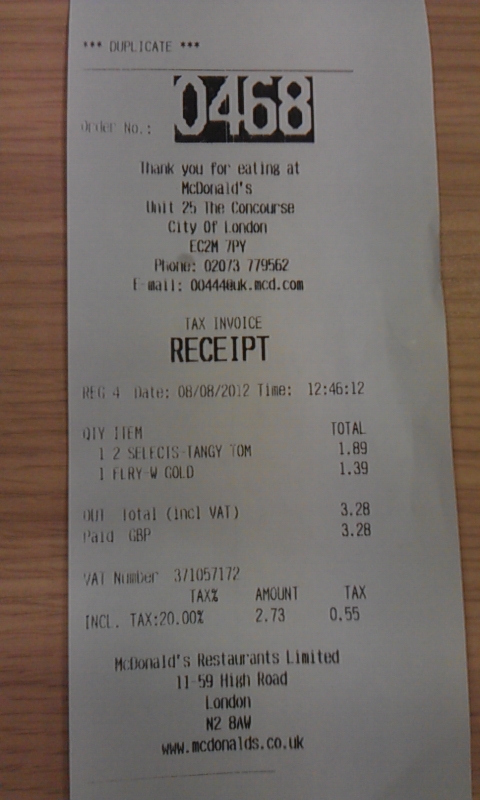 £1.39 wasn't discount promotional pricing, but it was actually pretty reasonable for London standards. The McFlurry was served in a thin plastic cup (similar to the one I had in Singapore a few weeks before), and I was glad to see as always that they used promotional packaging for this limited time item. 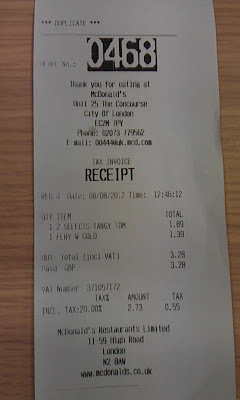 I guess since they were adding the London 2012 logo to everything, it wasn't so costly to add logos for the new promo items. The McFlurry ice cream was thicker than the ones I get out here in Asia, they are actually pretty similar to North American ones. Wispa pieces were big and chunky, I think they might have been refrigerated (or frozen) as they were nice and crunchy. The 'Gold' caramel didn't do much for me, with the amount of chocolate chunks inside, it was almost not noticeable.